Background. Recent studies have shown that isocitrate dehydrogenase 1/2 (IDH1/2)- activating mutations occur in a variety of cancers, including acute myeloid leukaemia, gliomas, and chondrosarcomas (CHS)s. The effect of IDH1/2 mutation on overall survival (OS) has not been reported in CHS. The aim of our study was to assess the prevalence of known cancer-related gene mutations in CHS, as well as their prognostic role in patient survival. Methods. DNA from FFPE samples of 80 patients (F:M- 1:1.3; mean age: 58 years; range 27-86) with histologically confirmed CHS (G1:29; G2:34; G3:17) was subjected to library preparation with the Ion AmpliSeq Cancer Hotspot Panel v2 and sequenced on the PGM Ion Torrent. Results. Among the clinical features only histological grade influenced OS. Deep sequencing identified 1784 single nucleotide variants. Of them, 426 were considered to be pathogenic or probably pathogenic. Activating IDH1/2 mutations were found in 27 patients (34%) including 17 R132 IDH1 (21%), 10 R172 IDH2 (13%) and 3 R140 IDH2 variants (4%). Three patients had concurrent IDH1 and IDH2 mutations. The R140 IDH2 mutant has not been reported to date in CHS patients. OS for CHS patients with IDH1/2 mutations was significantly lower than in patients without mutations (93% vs 64%; p<0.001). No other genetic feature of the Cancer Hotspot Panel had an impact on OS. Conclusions. In CHS, IDH1/2-mutation status and the histological aggressiveness of the CHS are important predictors for OS. The R140 IDH2 may also be a novel target for the treatment of CHS patients. Chondrosarcoma (CHS) is a rare bone or joint cancer typically affecting the population aged between 15 and 60 years, with male predominance. CHS can arise de novo, or grow out of a benign bone tumour such as an enchondroma or osteochondroma. Although the molecular background of CHS development is not clear, the increased risk for its development is linked to Ollier's Disease, Maffucci Syndrome, Multiple Hereditary Exostoses, and Paget's disease. Tumours can also arise in sites previously treated with radiation therapy or chemotherapy [1,2]. There are several subtypes of CHS: conventional, clear cell, myxoid, mesenchymal or dedifferentiated. Conventional and clear cell CHS are often low to intermediate grade tumours, but dedifferentiated and mesenchymal CHS are high grade tumours with spreading potential, and need multimodal treatment (10-15% of all CHS cases) [1,3]. The most common clinical manifestations are pain, swelling, or limited movement due to the growing tumour. The diagnosis is based on imaging studies (X-ray, bone, CT, MRI and PET scans), which must be follow by tumour biopsy to confirm the diagnosis. Complete surgical removal of the tumour is the most important treatment strategy, because CHS do not generally respond to chemo- or radiation therapy. Chemotherapy should be considered in mesenchymal or dedifferentiated chondrosarcomas, or in recurrent/metastatic disease. In selected cases, proton radiation therapy may be an option [4-6]. The prognosis of CHS is related to grade and histological subtype; the outcomes of high grade tumours, particularly dedifferentiated or mesenchymal subtypes, are poor due to the risk of recurrence and metastases. Only low grade tumours have a favourable prognosis. The reported 5-year survival ranges for chondrosarcoma grades 1, 2 and 3 are 82% - 99%; 63% - 92% and 5% - 77%, respectively. Five-year survival for dedifferentiated and mesenchymal CHS was reported to be about 24% . Peripheral CHS tumors have a favourable prognosis compared to central CHS and usually affect younger patients . Adverse prognostic factors are also considered, including axial localization of the primary tumour, size above 8 cm, distant metastases at presentation, positive surgical margins, presence of pathological fracture, or older age [8-11]. Recently published data highlights that prognosis may also be influenced by the molecular and genetic profile of CHS. For example, TP53 overexpression and mutations, as well as chromosome 17 alterations where TP53 is localized, are found in high-grade CHS, suggesting a TP53 pathway role in CHS progression [12,13]. The pRB pathway is another cell-cycle-regulating pathway frequently perturbed in CHS, with deletions and methylations of the CDKN2 gene, encoding p16 protein, being the most frequent events [14,15]. The loss of p16 protein expression is correlated with increasing tumour grade and poor prognosis . On the other hand, the markers responsible for the proliferative, “dedifferentiated” phenotype in bone, such as collagen (subtype I, II and X), proteoglycan (aggrecan)  or cyclooxygenase-2 overexpression , have never been shown to carry prognostic value. Isocitrate dehydrogenase (IDH) is a NADP+-dependent enzyme that metabolizes the conversion of isocitrate to α-ketoglutarate (αKG). The somatic mutations of IDH1 and IDH2 were initially identified in ~80% of gliomas , ~20% of acute myeloid leukaemias (AMLs) [20,21], and 50% of patients with CHS and cartilage tumours . Almost all mutations observed in IDH1 and IDH2 are monoallelic point mutations affecting only a few residues. The mutant IDH enzymes produce 2-hydroxyglutarate (2HG) from αKG. 2HG exhibits a >100-fold increase in IDH1/2-mutated tumour samples and may thus promote tumourigenesis by accumulating the putative oncometabolite [21,23]. IDH2 mutant expression in a murine model of mesenchymal progenitor cells triggered widespread DNA hypermethylation, impaired cell differentiation and induced loss of cell contact, ultimately leading to the formation of undifferentiated sarcomas when cells were grown as xenografts . The identification of prognostic and predictive factors provides insight into tumour biology, and treatment decision-making. We therefore decided to assess the relationship between the mutational status of IDH 1/2 and survival of patients with CHS. All procedures performed in studies involving human participants were in accordance with the ethical standards of the Local Bioethical Committee of Maria Sklodowska-Curie Memorial Cancer Center and Institute of Oncology and with the 1964 Helsinki declaration. Informed consent was obtained from all individual participants included in the study. We retrospectively included 80 patients with histologically confirmed CHS, who were treated at Maria Sklodowska-Curie Memorial Cancer Centre and Institute of Oncology, Warsaw, Poland, between 1996 and 2013. Median age of the patients was 59 years (range: 27-86). Male/female ratio was 1.22:1. The most common location of the primary tumour was the lower extremity, with 30 cases (38%). CHS was located in the upper extremity and axial skeleton in 22 (28%) and 28 patients (35%), respectively. In 43/80 patients (54%), the primary tumour size was greater than 8 cm in diameter; in 20 cases (25%) no information was available on tumour size at diagnosis, because patients were primarily treated outside our Centre. Regarding histological subtype and grade, all tissues were re-evaluated by a referral pathologist (second opinion). We observed 65 conventional (81%), 6 myxoid subtypes (7.5%), 6 dedifferentiated (7.5%) and 3 mesenchymal (4%) CHS. Low grade tumours (G1) accounted for 29 (36%) and high grade tumours were identified in 51 cases (64%): grade 2 - 33 cases (41%); grade 3 - 18 cases (23%). A surgical procedure was performed in 73 cases (91%). In this group there were 49 limb salvage operations (67%). The median follow-up period was 52 months (range: 1-185 months). DNA from tumour samples was extracted using a QIAamp DNA FFPE Tissue Kit (Qiagen), following the manufacturer's protocol. DNA sample concentrations were measured fluorescently using Qubit (Invitrogen), following the manufacturer's instructions, and stored at -20oC. DNA was subjected to library preparation with the Ion AmpliSeq Cancer Hotspot Panel v2, designed to probe 2,800 COSMIC mutations from 50 oncogenes and tumour suppressor genes, and sequenced on PGM Ion Torrent (Thermo), as described elsewhere . Briefly, molarity was determined for each DNA library and up to 16 libraries were pooled in equimolar concentrations and used for automatic template preparation on the Ion Chef, using reagents from the Ion PGM IC 200 Kit and Ion 318 Chip Kit v2 BC. Sequencing was performed on the Ion Torrent PGM sequencer using 500-flow runs. Data from the PGM runs were processed on the Ion Torrent server using a platform-specific pipeline incorporated in the Torrent Suite v5.0.3 (Thermo) to obtain sequence reads, trim adapter sequences, filter and remove poor signal reads, and assign the reads to a given barcode. The reads were mapped to the hg19 (Homo sapiens) reference genome and adjusted to the specific amplicon target regions of the Ion AmpliSeq Cancer Hotspot Panel v2 deposited in the “CHP2.20131001.hotspots” BED file, available in the Torrent Suite. Coverage analysis (v5.0.2.0) and variantCaller (v5.0.3.5) plug-ins used a set of default parameters optimized for calling somatic variants. Annotation of variants and their impact on mature protein was conducted by the Variant Effect Predictor  while deleteriousness was assessed with SIFT , PolyPhen  and Condel  algorithms. A variant was considered pathogenic if it was predicted as deleterious by these three algorithms, had a high impact on protein coding (stop-gained, frameshift etc.) or was previously reported as pathogenic in ClinVar. Overall survival (OS) was calculated from the date of the pre-treatment biopsy or first operation (whichever occurred earlier) to tumour-progression-related death or the latest follow-up date. Disease-free survival (DFS) was calculated from the date of the end of treatment to the date of recurrence or to the latest follow-up date. Univariate analysis of the association between OS and clinical factors was based on the Kaplan-Meier estimator and the log-rank test. To investigate the relationship between categorical parameters and IDH1/2 mutation status, the Fisher's exact test was used. The effect of deleterious variants was assessed with the log-rank test and type I error was controlled with the Benjamini-Hochberg adjustment for multiple comparisons . The analyses were performed with STATA (version 13) and R language (version 3.3.0) . The anonymised sequencing datasets generated during the current study are available in the European Nucleotide Archive repository under the accession number PRJEB20222. We identified 1,784 unique variants across all 50 genes included in the Cancer Hotspot Panel v2 (Table S1). Among them 614 were considered pathogenic or likely pathogenic according to SIFT, PolyPhen and Condel algorithms, or had a high impact on protein coding (stop-gained, frameshift etc.). Variants likely to be deleterious were submitted to further analysis. The most frequently mutated genes included TP53 - 39 samples (49%), IDH1 - 17 samples (21%), EGFR - 15 samples (19%) and IDH2 - 13 samples (17%). The mean number of variants discovered in a sample was 8.93. In 23 samples (29%) no point mutations were found in regions included in the Cancer Hotspot panel v2. The structure of genetic variance among the investigated samples is shown in Figure 1. IDH1/2-activating mutations were found in 27 patients (34%), including 17 cases with R132 IDH1 (21%), 10 cases with R172 IDH2 (13%) and 3 cases with R140 IDH2 variants (4%) (Figure 2). The R140 IDH2 mutant has not been reported to date in CHS patients. Interestingly, three patients had a concurrent mutation in IDH1 and IDH2 (Figure S1). The coexistence of IDH1 and IDH2 mutations, and R140 IDH2 mutations was confirmed by the resequencing of appropriate specimens. There was no significant effect on patient survival for any other variants evaluated in the Cancer Hotspot Panel v2. The patients with activating IDH1/2 mutations had a 5-year OS rate of 64% compared to 93% in those without (p < 0.001) (Figure 3). When each IDH gene was analysed alone, the IDH1 mutation carriers had worse OS compared to the IDH1 mutation negative group: 68% vs 87% (p=0.029); and to the IDH2 mutation patients: 67% vs 86% (p=0.009). The relationship between IDH1/2 status and histological grade was not statistically significant, however we observed that the IDH1/2 mutation was present in 21% of G1 tumours, 39% of G2, and was highest in G3 CHS (44%). Notably, the IDH2 mutation was more frequent in high grade tumours (low grade: 7%; high grade: 22%). Interestingly, all three cases of R140 IDH2 variant were high grade. The statistical trends were noted for IDH1/2 mutation status and patient age. 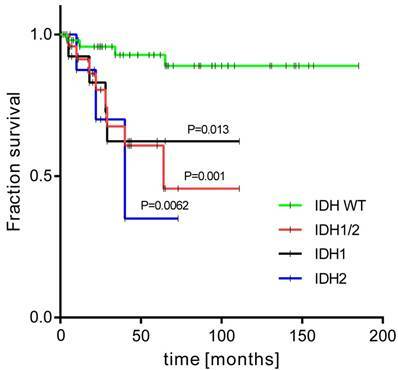 Eleven patients were aged under 40 years and only one of them had an IDH1/2 mutation, in contrast to older patients, in whom IDH1/2 mutations were present in 37% of cases (P=0.063). Activating mutations in IDH1/2 genes have been shown to exist and play a vital role in tumour development in a variety of neoplasms. They were initially described in brain tumours - gliomas, glioblastomas and astrocytomas [32,33]. 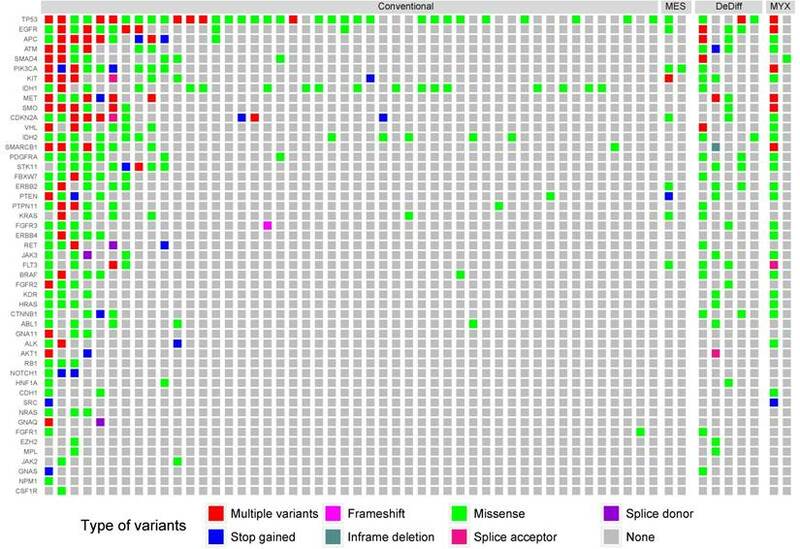 Data suggest that IDH1/2 mutations are present in the vast majority of secondary glioblastoma cases . In gliomas and glioblastomas, it has also been shown that the IDH1/2 mutation is associated with better patient prognosis [35,36]. Another group of neoplasms in which IDH1/2 alterations have been described are blood malignancies, namely myelodysplastic syndromes, AML and chronic myelomonocytic leukaemia . IDH1/2 activation mutations are present in about 20% of AMLs and carry a negative prognosis value for patients [20,38]. The distribution of mutations according to histological grade. Only samples containing alternative variants are included. MES, DeDiff and MYX abbreviations refer to mesenchymal, dedifferentiated and myxoid chondrosarcoma subtypes, respectively. Number and localization of activating mutations found in IDH1 (above) and IDH2 (below) genes. Visualization was performed with MutationMapper . Kaplan-Meier survival curves of overall survival for groups with and without activating mutations in IDH1/2 genes. In our study, activating IDH1/2 mutations were present in 34% of CHS tumours in the Polish population and had adverse prognostic impact on survival. This number is lower than reported in previous studies in CHS. Amary et al. reported 56%, while Tarpey et al. found a prevalence of 59%. Conversely the prevalence of IDH2 mutants was higher in our study than in Amary's work: 7.5% vs ~4.8%. In contrast to our findings, Amary et al. reported no differences in the OS of patients with and without IDH1/2 mutations. However, while previous studies [22,39] reported IDH1/2 mutations mostly in central but not in peripheral chondrosarcomas, all our patients suffered for peripheral chondrosarcomas. Furthermore, recently published study  confirmed the presence of IDH1/2 mutations in 87% (20/23) of dedifferentiated chondrosarcomas and in 30% (6/20) of conventional chondrosarcomas; 81% of our patients suffered for conventional chondrosarcoma. We found TP53 mutations in about half, and EGFR in 19% of CHS patients, but there was no statistical relationship between mutations in these genes and OS. Tamoxifen-inducible expression of mutant IDH1 in chondrocytes resulted in enchondromas: benign cartilage tumours which are precursors to malignant CHS . Arai et al. analysed 13 CHS and found IDH1/2 mutations in six cases. The more aggressive behaviour of CHS was linked to IDH1/2 mutations. It has been proposed that the IDH1/2 mutation status may be used for distinguishing intracranial chondrosarcomas from chordomas and chondroblastic osteosarcoma . We additionally observed that high grade tumours expressed IDH1/2 mutations more often than did low grade CHS; specifically IDH2 was present in 22% of high grade CHS, and only in 7% of low grade tumours. We also showed a statistical trend between IDH1/2 mutations and patient age. It is important to highlight the presence of the R140 IDH2 mutation in 3 CHS samples (all cases were high grade tumours). This genetic feature has not been described in CHS before. Monotherapy based on specific inhibition of mutant IDH1 using AGI-5198, although decreased levels of 2-HG in a dose dependent manner, may not be sufficient for treatment of inoperable or metastasized chondrosarcoma patients . However, a specific IDH2-R140 inhibitor, AG-221 (Enasidenib) was recently approved by the FDA to treat adult patients with relapsed or refractory AML, after in a phase I/II trial it induced an overall response rate of 40.3% in IDH2-mutated AML patients . Hence this new targeted drug could in the future be tested on IDH2 R140-positive CHS patients. Regarding clinical factors and their prognostic role, histological grade was the most important factor, which is in line with previous findings by Evans et al. and Giuffrida et al. . Other prognostic factors negatively influencing the prognosis are as follows: metastases, non-operable disease, positive surgical margins, age over 55 years, clinical diameter of the tumour above 8 cm . However, our database had limited information about surgical margins and tumour size and, probably due to the small sample size, we were unable to confirm the statistical differences between OS and the above-mentioned parameters. In our patients only histological grade was a statistically important factor, with a linear trend. Five-year OS was 95% in G1, 82% in G2, and 62% in G3 tumours. To date performed studies on IDH1/2 mutations prevalence in CHS have used mixed mutation detection technologies and assays. For example, Amary et al. employed mass spectrometry on MassARRAY platform followed by IDH1/2 mutations validation with capillary sequencing . Same group in another study by Tarpey et al. utilized Exome-Seq assay with sequence coverage at a depth of 30× . Moreover, Kerr et al. adapted SNaPshot platform combined with capillary sequencing validation  and Arai et al. used capillary sequencing and immunohistochemistry to identify IDH1/2 and IDH1 mutations, respectively. 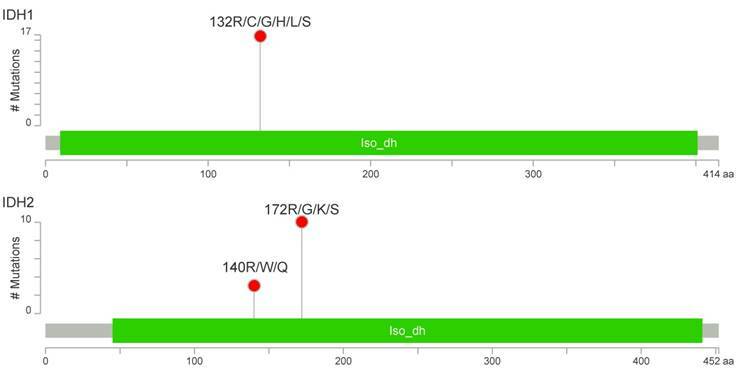 Finally, Chen and colleagues  used IDH1/2 RGQ PCR Kit from Qiagen that utilizes primers and probes to perform allele-specific amplification with a readout in a real-time PCR machine. In this study, we used Thermo's AmpliSeq technology coupled with next-generation sequencing (NGS) on Ion Torrent PGM platform and on average we generated sequence coverage of ×1667 and ×685 for IDH1 and IDH2 amplicon, respectively. We believe that such a high coverage offers the sensitivity that outperforms aforementioned assays and ultimately allowed us, for the first time, to identify the IDH2 R140 mutant and concurrent IDH1/2 mutation in CHS cases. While the presence of IDH1 and IDH2 mutations is frequently thought to be mutually exclusive, 3 out of 27 CHS patients (11%) in our study had concurrent IDH1/2 mutations. Interestingly, such cases have previously only rarely been identified in mutational studies focused on IDH1/2: in gliomas (4 out of 739 IDH1/2 mutation-positive cases - 0.005%)  and AMLs (2 out of 125 IDH1/2 mutation-positive cases - 0.016%) . Such a high frequency of concurrent IDH1/2 mutations observed among CHS patients could be due to the higher sensitivity of the NGS compared to the Sanger sequencing method, used in the aforementioned studies on gliomas and AML samples. It is difficult to detect somatic variants at frequency levels below 10% with Sanger sequencing , while NGS permits identification of variants at frequencies of 0.1% or lower [52,53]. Hence the co-occurrence of IDH1/2 mutations in gliomas and AMLs could also be higher than previously thought. Findings on the adverse prognostic value of IDH1/2 mutations opens new clinical possibilities in the management of CHS patients and could help modify potential treatment and surveillance strategies. It also provides a theoretical basis for pursuing IDH1/2 mutation as a druggable target in CHS treatment. However, preclinical and clinical trials are warranted to prove this hypothesis and test the efficacy of IDH1/2 mutant inhibitors in CHS treatment. CHS: chondrosarcoma; IDH: isocitrate dehydrogenase; OS: overall survival; DFS: disease free survival; NGS: next-generation sequencing. This study was funded by The National Centre for Research and Development (grant STRATEGMED1/233574/15/NCBR/2015 - EPTHERON).